A90-year-old woman presented to the emergency department of University Hospital of North Staffordshire with a one-day history of breathlessness and chest discomfort. She had no history of significant respiratory or cardiovascular disease. Figure 1: Radiograph of the chest at the time of admission. Clinical examination revealed elevated jugular venous pressure, minimal pedal edema, a systolic cardiac murmur and bibasal lung crackles. An electrocardiograph demonstrated left bundle branch block and left axis deviation. A chest radiograph revealed the abnormality shown by the arrow in Figure 1 which disappeared after two days of in-hospital treatment [Figure 2]. 1.What is the clinical diagnosis? 1.Cardiac enlargement, pulmonary edema and presence of a tumor-like mass. 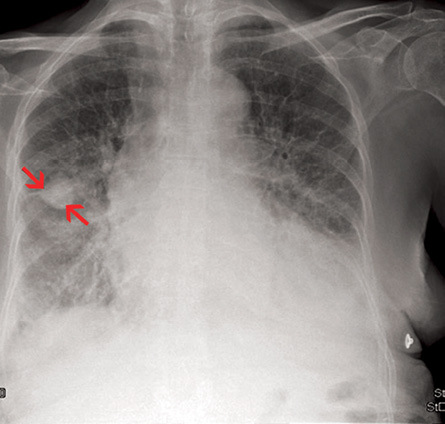 The chest radiograph showed cardiac enlargement, pulmonary edema (“bat wing” appearance in the lungs), and a tumor-like mass in the right mid-zone [Figure 1, arrows]. Echocardiography revealed moderate aortic regurgitation and a left ventricular ejection fraction of 35%. She was managed with oxygen, intravenous furosemide and oral ramipril leading to rapid improvement of symptoms. 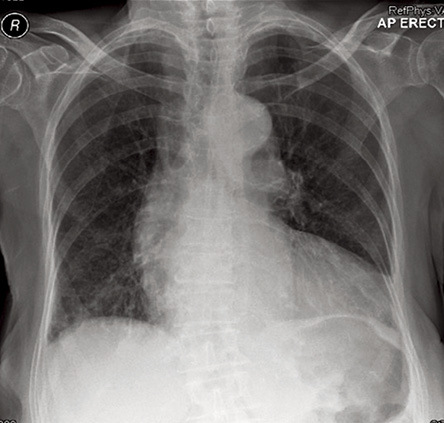 A chest radiograph two days later showed disappearance of the tumor and complete resolution of pulmonary edema [Figure 2]. Alderisio WG. Images in cardiovascular medicine. Vanishing tumor. Circulation 2007 Apr;115(13):e381-e382. Ardic I, Yarlioglues M, Celik A, Kaya MG. Vanishing or phantom tumor of the lung. Tex Heart Inst J 2010;37(6):730-731. Davies MK, Gibbs CR, Lip GY. ABC of heart failure. BMJ 2000 Jan;320(7230):297-300.